Molinia caerulea (M25) dominant site (Grid ref. SN411 499) Situated near Talgarreg, Ceredigion. 190 metres above sea level. Aprox. 49km south of Aberystwyth, 61km south west of ADAS Pwllpeiran. 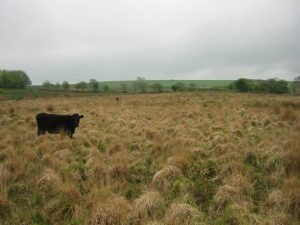 This is a NATURA 2000 site managed by the Countryside Council for Wales (CCW). Molinia caerulea is an invasive species, and if not controlled by grazing the annual build up of senesced material can constitute a serious fire risk on Welsh hills.